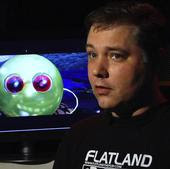 Full of dry wit and wry satire worthy of Monty Python, Flatland is the imaginative creation of independent filmmaker Ladd P. Ehlinger Jr., who directed, animated and edited the entire feature film. You can find him on MySpace, as I did. Adapted from the 1884 novel by Edwin A. Abbott, the story follows its hero A Square, who inhabits a world that is completely flat and two-dimensional. A mysterious visitor from the third dimension arrives, bent on spreading the gossip about another dimension called height. A Square is taken out of Flatland and transported to the 3D universe. In so doing, the very fabric of space-time itself is placed at risks, potentially destroying all of creation. Widely reviewed, Ladd has earned critical acclaim from Film Threat, Scifi.com, and Aintitcool, among others. Flatland clips have been frequently viewed on Youtube.